Thank you for participating in the 2018 Founders Day of Giving! The Delta Upsilon Educational Foundation's third annual Founders Day of Giving was a success! Thank you to all those who donated. This 24-hour campaign is an international effort to inspire DU alumni, undergraduates, parents and friends to make a gift so the DUEF can continue our tradition of Building Better Men. 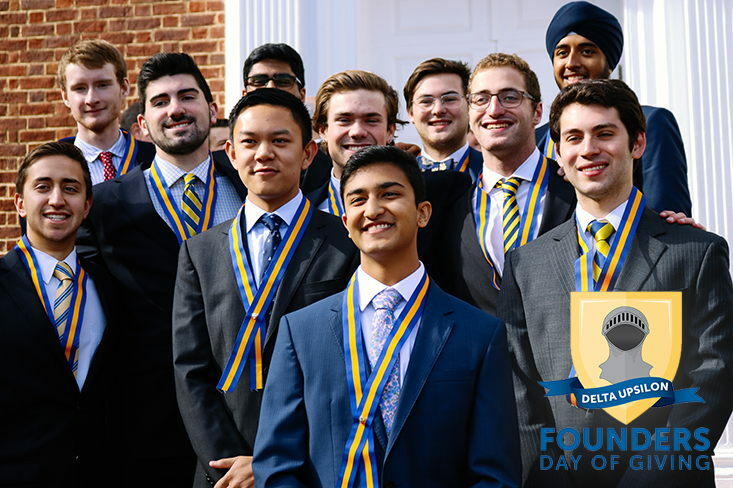 Gifts during the Founders Day of Giving benefited the DUEF's Annual Loyalty Fund, providing academic scholarships, scholarships to attend DU and NIC educational programs, and support for all fraternity educational initiatives. With the support from members, alumni, parents and friends, we enable Delta Upsilon to continue to better the lives of our members. Mark your calendar for the next Founders Day of Giving: Nov. 4, 2019. Through tax-deductible donations to the DUEF, the Foundation is able to fund important Fraternity programs and initiatives. Below are just a few of the impactful educational programs the DUEF supports through grants and registration scholarships. "By attending the educational programs put on by Delta Upsilon, such as RLA and LI, I have become a better man and now have the tools to show others how to be better versions of themselves. It is essential to give back to the DU Educational Foundation so we may continue to build better men." What is the Founders Day of Giving? This 24-hour campaign is an international effort to inspire DU alumni, undergraduates, parents and friends to make a gift to the DUEF. Gifts of any size are welcome. The 2018 event will focus efforts on Monday, Nov. 5. Like popular, national events like Giving Tuesday, the Founders Day of Giving is a day dedicated to raising funds for the DUEF. The Fraternity’s Founder Day—was chosen as a way for brothers to celebrate 184 years of brotherhood and give back to the organization that means so much to members. Yes. The Delta Upsilon Educational Foundation is a 501(c)3 organization, meaning your gift is 100% tax deductible. The Founders Day of Giving aims to support the DUEF’s Annual Loyalty Fund. This is the Foundation’s general fund, and money in it can be used to support any DUEF initiative. From funding Delta Upsilon educational programs like the Regional Leadership Academy, GSI and the Emerging Leaders Experience to academic scholarships. To be successful, the DUEF must have a robust Annual Loyalty Fund. Yes. You will receive an electronic receipt after making your gift. In addition, you will receive a year-end tax mailer for any contribution to the Delta Upsilon Educational Foundation for the 2018 calendar year in January. If you need a hard copy of your receipt, please email Development Director Meghan Bender at bender@deltau.org. If I send a gift in the mail, will it still count toward the Founders Day of Giving? We will gladly accept checks for the Day of Giving. Please write “Day of Giving” in the memo. Any check postmarked by Nov. 6, 2018, will be counted toward the day. Yes, the DUEF does accept gifts of stock. To do so, please follow the instructions here. You can contact the DUEF by calling IHQ at (317) 875-8900, or by emailing Advancement Director Colin Finn, Iowa State ’05, at finn@deltau.org.